“Indoor air can be two to five times more polluted than the worst outdoor air.” – Environmental Protection Agency Protect the Air You Breathe. Complimentary Air Quality Test. “Excellent service. Same day quote, beat the competition. 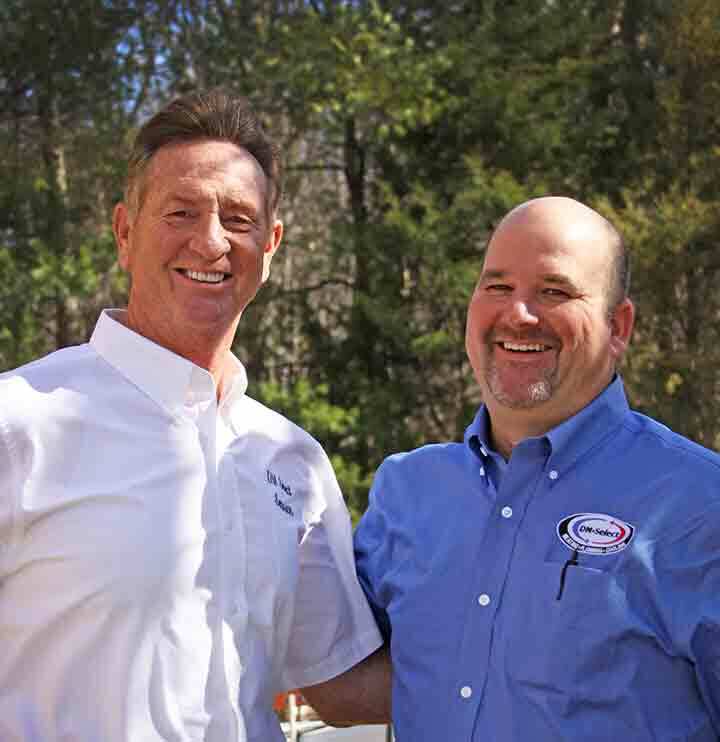 Local owners, Dan McCarthy and Jim Workman have provided Northern Virginia plumbing, heating and cooling services and installations since 1983. The DM Select Services team of highly-skilled professionals are an extension of the owners passion for excellence and value. DM Select Services fleet of plumbing and HVAC service and installation professionals are prepared to solve your problems in a timely manner. 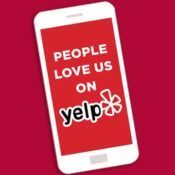 Our respect for every single customer and high quality of service is evidenced by our A+ rating with the Better Business Bureau and outstanding reviews on Yelp, Google and Angie’s List. We serve all of Northern Virginia’s residential and commercial heating, air conditioning and plumbing needs. The letters H-V-AC form an acronym for heating, ventilation, and air conditioning. These heating and cooling systems are installed in homes, commercial buildings and automobiles. An HVAC system controls indoor temperatures and also provides fresh outdoor air and a venting system to dilute indoor contaminants and volatile organic compounds. Click the links to learn more information about HVAC systems in general and the mechanical aspects of heat-vent-ac equipment. HVAC unit components work by hot and cold exchanges to provide heating and cooling as well as ventilation to multiple rooms and floors of a building, such as a home or offices. Watch a video animation and explanation of how an integrated heating and cooling system work, and why installing a heat/vent/ac system in your home or commercial office saves energy. Call today for the Virginia heat, ac and plumbing service location near you! 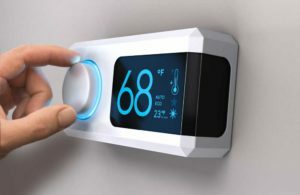 Give DM Services a phone call today for heating and cooling, air conditioner installation and air conditioner repair, hot water heater, furnace installation and furnace repair, heat pumps, duct cleaning, thermostat, hybrid system, ductless mini split, heater inspection, ac inspection, HVAC maintenance, plumbing and all your home systems needs. What Happens When I Call DM Select for an Appointment? Once you make an appointment with our company one of our skilled technicians will come to your residence or commercial property to assess the situation. They will discuss the details of the work fully with you, and will begin the installation or repair service to ensure that your heating and cooling system remains fully active and the quality of the indoor air is high. If you have concerns about another company’s prices or quality of work, we will come and give you a free and honest second opinion and offer you the best cost anywhere to set things right. For big jobs we also offer financing and online payments. For more information, just call or email us at 703-721-4844 and info@dmselectservices.com respectively. Alternatively, you can also visit our website at https://www.dmselectservices.com/. We place very high value on customer servicing and satisfaction and look forward to hearing from you. With rapid and often extreme fluctuations in the weather, it is essential to have safe and reliable heat, air ventilation, and air conditioning in your home and at work. Headquartered in Burke, Virginia, DM Services is the top rated HVAC contractor that provides heating and air conditioning, installation and repair services to residences and businesses. The company installs home heaters and air conditioning systems as well as commercial HVAC systems from all the top brands. With nearly four decades in the plumbing, heating and air conditioning industry in Northern Virginia, our company’s stellar results come from the skilled team of experienced and knowledgeable technicians, who are dedicated and highly motivated to provide immediate plumbing, heating and air conditioning solutions to our customers any day of the week or even at night for emergencies no matter what the weather – rain, sun or snow. All of our technicians are highly trained and qualified and have all the necessary tools, equipment and knowhow to guarantee that you receive the best service possible for all your heating, cooling and plumbing needs. Steve Hylton from DM Select Services just left, and within minutes the temperature in my townhouse was back up to a perfect 74 degrees. Not bad for this recent 16-degree cold spell right before the New Year. The preliminary phone call said that the office closes at noon on Saturdays, but Steve showed up anyway and made me feel very happy with my choice of using DM Services for my new HVAC installation and repair (under warranty) this year. Thanks, Steve and DM Select Services. You are the best! Nothing is more difficult than discomfort without any ac through the dog days of summer or shivering indoors without heating in the sleepless nights of the winter. DM Select Services, a regional residential and commercial HVAC contractor, works hard to keep your house welcoming and comfortable by providing HVAC services. Contact our HVAC Company now to schedule a consultation and determine why our team is one of the greatest rated HVAC repair contractors in Northern Virginia! After many years serving Northern Virginia area, we’ve learned that routine ac maintenance and heating maintenance is central to controlling the life span of your own air conditioner and furnace. Keeping along with frequent HVAC inspections could be your most important and proactive option to stop future breakdowns and expensive replacements. Keeping cool can be really a consistent struggle throughout summer time.Maintaining your air conditioner so it’s healthy and happy helps to ensure that you remain comfortable 24/7. DM Select Services, Burke’s top air conditioning contractor strives to always offer you the greatest central ac service in Northern Virginia to continue to keep our neighbors contented and satisfied. We’re considered among the most trustworthy local air-conditioning service contractors able to trouble shoot all of air conditioning issues. Despite the fact that Northern Virginia might have mostly colder weather all through this calendar year, a fully serviced air conditioning unit remains essential. Nothing else hastens the 90° fever throughout the peaks of the summer. While you may not want to use your ac during the whole Year, you’re going to be quite thankful that it is there once you require it. The specialists on our air conditioning systems service crew are able to assist you to locate the very best unit for your home’s central air and heating needs! DM Select Services retains the very best and experienced ac technicians. Our air conditioning team offers the highest caliber AC repair services for Burke residents.Additionally, we are very much focused on outstanding customer service. Its what enables us to establish great relationships and build trust with our customers. We appreciate the confidence our customers put in us, and we endeavor to always offer services that are very dependable. We perform our ac repairs and inspections based upon your convenience. We will do our utmost to schedule an air conditioning repair service at a time that’s ideal for you. Our technicians will deliver professional services to your complete satisfaction. Moreover, we hire only the very best ac technicians. We give quality technical training to all our employees. 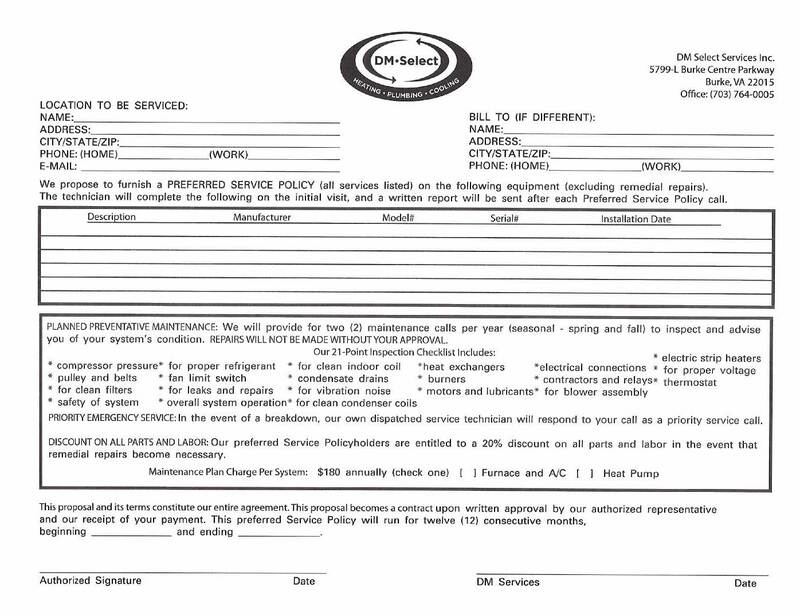 This helps to ensure that all our customers receive air conditioning services that they expect. Each DM Select employee on the team is trained in the most up-to-date air conditioning maintenance and repair techniques.